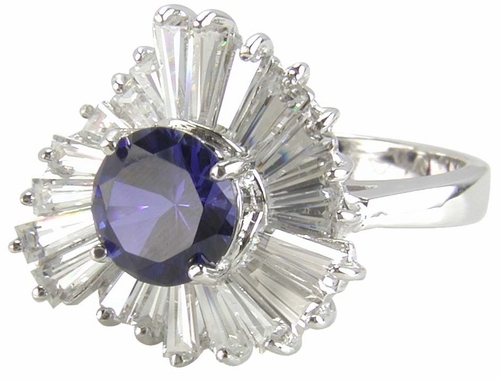 Our Pinwheel 1.5 Carat Ballerina Cluster Simulated Man Made Sapphire Round and Cubic Zirconia Baguette Ring is a unique ring featuring tapered baguettes surrounding a 1.5 carat 7.5mm round sapphire blue simulated man made gem in 14k white gold. 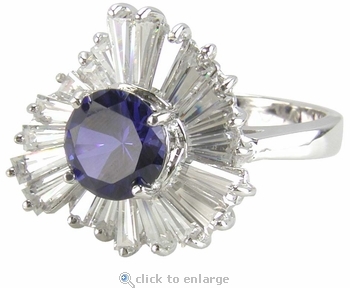 The tapered baguettes flow around the high quality sapphire gem presenting a pinwheel effect. This ballerina cluster ring has a modern look coupled with a traditional feel. All Ziamond cubic zirconia is hand cut and hand polished to exact diamond specifications. Russian formula cubic zirconia by Ziamond offers diamond quality jewelry at an affordable price. The total carat weight is approximately 2.5 carats.